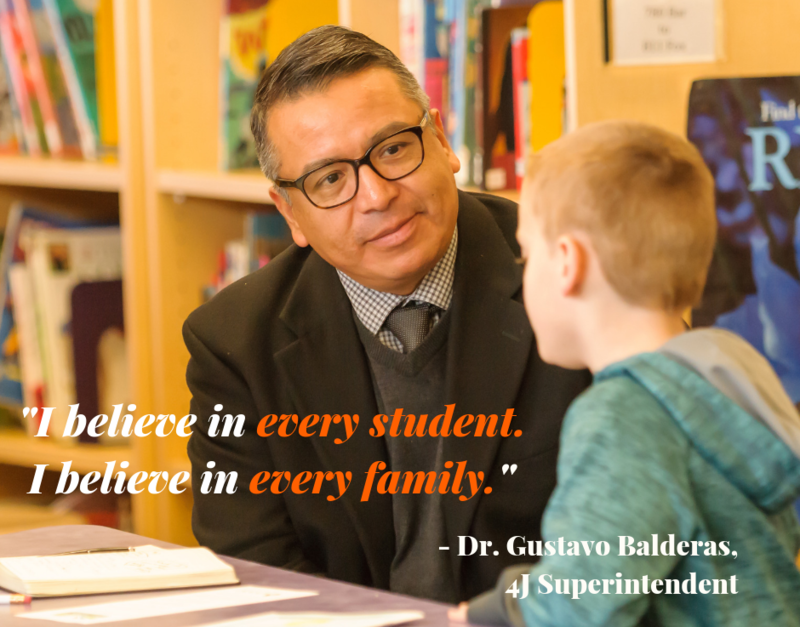 Dr. Gustavo Balderas is the superintendent of Eugene School District 4J in Eugene, Oregon. He became the district’s 23rd superintendent in 2015. Dr. Balderas began his life as the child of migrant farm workers in eastern Oregon and developed his love of learning and passion for education in Oregon public schools, from kindergarten through his doctoral degree in educational leadership at the University of Oregon. Dr. Balderas has been an educator for more than 25 years. He started his career in education as a high school teacher and counselor in the Hillsboro School District. He moved on to elementary and middle school administrative roles and then served as an area executive director overseeing a cluster of K–12 schools and coordinating district curriculum, as well as serving as an assistant superintendent of support services, also all in the Hillsboro School District. He then moved to California to serve as the superintendent of Madera Unified School District in Madera, Calif., before becoming the superintendent of Ocean View School District in Huntington Beach, California. He then moved back to Oregon to serve as 4J’s superintendent. His career highlights include improving equity and cultural proficiency in the state’s K–12 instruction through the Oregon Leadership Network and the Oregon State Action for Educational Leadership Project, and developing equal access and opportunity to instruction and equity systems around student behavior and hiring practices in the school districts where he has worked. Dr. Balderas was appointed to serve on the Oregon State Board of Education in 2018. Being engaged with the community is important to Dr. Balderas, and he serves on several local and state educational and civic boards to develop and grow community partnerships. In addition to serving on the Oregon State Board of Education, he is a board member of the Oregon Department of Education English Learner Advisory Group, Connected Lane County and Early Learning Alliance. Dr. Balderas also is a volunteer consulting superintendent for the Educational Research and Development Institute and the Suburban School Superintendents national organizations. He is a founding member and past president of the Oregon Association of Latino Administrators. He currently serves as the NW regional representative and treasurer for the national Association of Latino Administrators and Superintendents. Dr. Balderas also serves on the boards of United Way of Lane County, Eugene Area Chamber of Commerce, Trillium CCO Community Advisory Board and PeaceHealth Sacred Heart Medical Center Community Health Board. He collaborates with other government agencies, area businesses and nonprofit organizations to provide the highest quality of education and care for students.